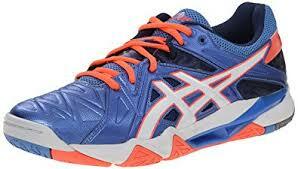 When looking for the best volleyball shoes for your youth player’s needs, consider the ASICS Gel Upcourt GS. 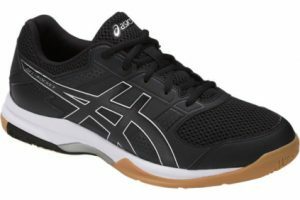 This pair of ASICS youth volleyball shoes has been specially built to protect the ankle health of younger volleyball players. It also has a wide variety of comfort and stability options that make it useful for other gym sports, though it remains most appropriate for volleyball. Please read on to discover why these shoes are so respected. If they sound great to you, take your child to a shoe store and have them try on a pair. This can give them a feel for how they will feel on the court and help them decide if they are right for their unique needs. The Gel Upcourt GS is a great shoe for youth volleyball players because it is designed to protect their ankles and keep them from needless personal injuries on the court. For example, it comes with a Gum Rubber outsole that provides increased traction on the court. This protects them from falling and suffering from physical injury when they hit the floor. Each pair is built out of tough leather that provides a nice level of give that makes it possible to squeeze into a wide variety of shoes. An air-flow mesh is designed to bring air into your feet and let smells out. 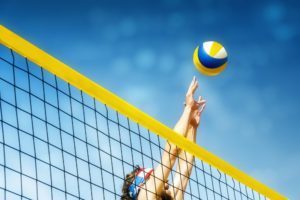 Flowing air is an important way to protect the feet of youth volleyball players from the creation of blisters and other health foot health problems. Beyond these options are a variety of comfort and safety features, including the Rearfoot cushioning system. A small layer of gel is installed in the sole of each foot, making it adaptable to multiple feet and providing extra comfort and cushioning. Extra cushioning like this helps create extra support and a “quick reaction” ability that makes it easy to move from back row defense and front row offense. The comfort and stability of these shoes makes them adaptable for a youth volleyball player. Their supportive leather structure protects the ankle from getting injured while jumping, pivoting, and running. Toe support and ankle support are also key when diving for the ball in tense gaming situations. The tough-grip rubber soul is also great for providing a little bit of extra lift for your youth volleyball player. This is great for shorter players who end up in front of the net. An extra boost when jumping can help them get their hands on the ball for a block or even a spike. That said, you can also use these shoes for other types of gym sports. For example, an old pair could be adapted to useful indoor sprinting shoes or practice shoes for basketball. 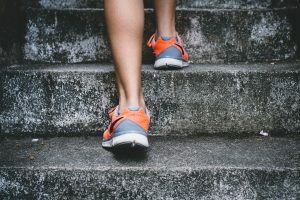 Typically, you’re going to want sport-specific shoes when actually competing, however, so make sure to buy basketball or sprinting-appropriate shoes for your child if they compete in these sports. These shoes come in five different color options which will give you and your child some choice on style. 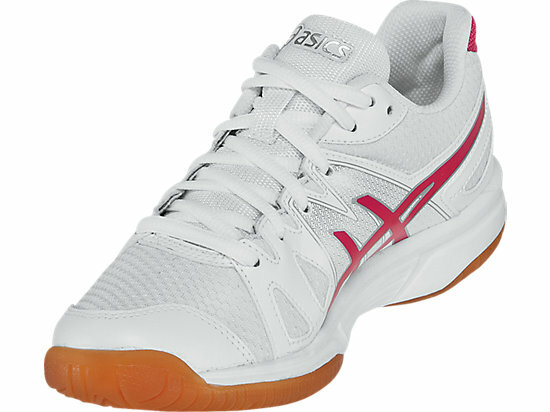 Youth volleyball players need great ASICS youth volleyball shoes to provide them with stability during their practices. Is it worth buying two pairs of the Gel Upcourt GS to keep them from wearing out on your youth athlete? That depends on a variety of variables. 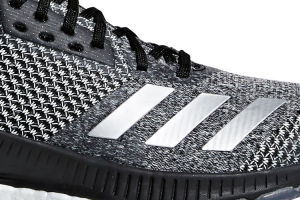 First of all, these shoes need to be broken in for the best effect, and switching between two different models may make this process more difficult. However, having two pairs of shoes can be a useful way of providing your child with specialized support for practice and games. For example, most practices will require simple drills with slow-paced practice games. This will create a different level of “breaking in” than game shoes, which will be subject to more severe and fast-paced gaming experiences. If you do decide to buy two pairs of the Gel Upcourt GS, it is a good idea to pick two different colors. This will make it easier to tell apart the practice and the game shoes. Make sure that your child always wears the right pair of shoes to avoid any kind of potential pain or damage to their feet. While wearing the wrong pair isn’t dangerous, it could be more uncomfortable if done unexpectedly. While this pair of ASICS youth volleyball shoes shouldn’t be used in outdoor sporting environments, your child may end up taking them jogging or even exploring the wilderness. As a result, they can get stained with mud and dirt rather easily. Even if your child uses them properly, damage can still occur from regular game play. As a result, it is important to clean them regularly with a small toothbrush. A small dose of warm water and anti-grease soap should be more than enough to clean their surface. Remove smells by scrubbing the interior with soap and water and drying with paper towels. Hand dry the whole shoe and add an anti-smell item, such as baking soda, on the dry bottom. More problematic damage, such as breaks, may require specialized shoe repair services. Machine washing and drying is not an option with the Gel Upcourt GS. This will cause irreparable heat and water damage that will make them unsuitable for use. After purchasing one or more pairs, make sure your child wears them around the house for a few days before practice or a game to break them in a little. Now they can be broken in on the court properly, providing the best volleyball shoes available. This is one of the best Asiscs youth volleyball shoes on the market and it rates very high with 4.6 out 5 stars with 94% four stars or higher, and no 1 star reviews. This is definitely one of the top rated volleyball shoes for kids, and we highly recommend it.